A slippery floor is a major workshop hazard. We treated my chipboard floor by coating it with floor varnish and sprinkling sand over it while the varnish was wet. When the varnish was dry we swept the floor to remove any loose sand and used the remainder of the varnish to seal the surface. This has been very successful. 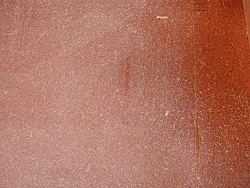 Shown here is a as small area of the floor with its sand coating.